The wheel may be one of humankind’s first inventions, but that doesn’t keep us from continuing to tinker with it. The Energy Return Wheel or ERW is a radical redesign of the common tire that promises to improve any vehicle’s handling and mileage – the suspended “wheel within a wheel” is essentially a spring that absorbs energy from bumps and returns it back to the road. The design is a unique take on tire dynamics – traditional tires and even newer designs simply absorb energy of traveling over bumps. Like Bridgstone’s Tweel The ERW wheel looks completely different from the tires we’ve been using since Charles Goodyear discovered vulcanized rubber. It is made from two steel hoops – one is nestled within another and suspended by a series of springs. The outer hoop has a rubber casing like a typical tire and an inner membrane. The inner hoop has studs attaching the springs to the wheel, which can be torqued to make the tire more or less springy. The inventor likens the dynamic of the tire to a garage door, which while very heavy, is balanced with springs to significantly reduce the energy of moving the door up and down. The outer ring of the ERW moves upwards over a bump and springs back while the inner ring stays in relatively in the same place. This means that at cruising speed all those little bumps and vibrations in the road are absorbed and returned to the road by the tire in the form of forward momentum. 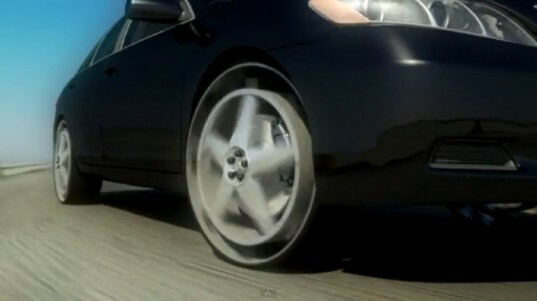 A typical inflated tire simply absorbs the bumps by flexing the sidewall, creating friction, which reduces efficiency. It’s not clear how far development on the technology has progressed, or even how it handles on the open road. One potential pitfall is that the open space between the two hoops looks like a mud magnet (although this appears to be addressed in new renderings). Another concern is whether the steel hoop will be able to maintain structural integrity after hitting a major pothole. One thing is certain – ERW tires will definitely turn heads, especially if they are mounted on a Tesla Roadster or a Fisker Karma. can it prove to be better in wear resistance as well??? or the external rubber material need to change accordingly??? "This means that at cruising speed all those little bumps and vibrations in the road are absorbed and returned to the road by the tire in the form of forward momentum" How does this happen? The language is painfully unscientific! The manufacturer appears to be claiming that lost energy is recovered as a vehicle clears a bump. They are also claiming to have eliminated a large amount of friction when compared to pneumatic tires - but they give no information on the amount of friction produced by their designs and there is no comparison available between their designs and a standard pneumatic tire. Unless they are claiming that their design does not produce friction! Some of us need information, not fluffy descriptions about garage doors! One advantage of these airless tire designs is that there's no longer a fixed relationship between the squishiness of the tire and the sturdiness of the sidewall. You can have big, off-road tires with inches of compression, but practically no lateral movement. What I'm looking forward to seeing is how they address the effects on performance from all that rapidly rotating weight on the wheel. Its bound to have some effect on acceleration and mileage. Also, power transfer has to be an issue. How do you get the electricity back to where it's needed? If this is to be useful, you have to have a rotating electrical connector that's able to transfer a lot of juice while providing minimal friction at thousands of RPM and lasting for years. The wheel may be one of humankind's first inventions, but that doesn't keep us from continuing to tinker with it. The Energy Return Wheel or ERW is a radical redesign of the common tire that promises to improve any vehicle's handling and mileage - the suspended “wheel within a wheel” is essentially a spring that absorbs energy from bumps and returns it back to the road. 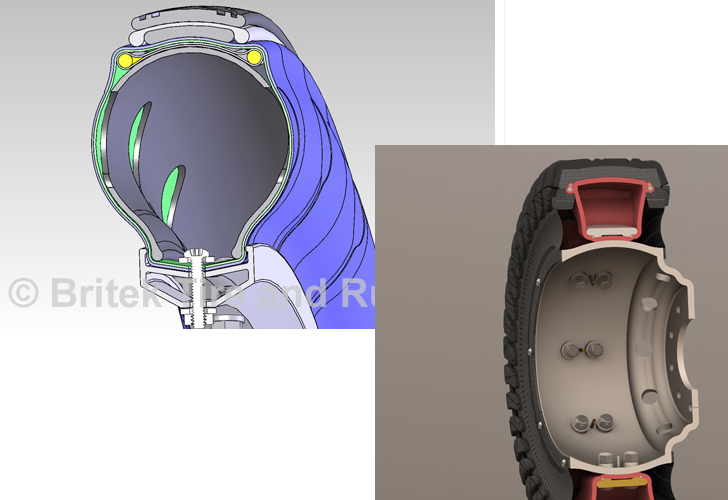 The design is a unique take on tire dynamics - traditional tires and even newer designs simply absorb energy of traveling over bumps.